Over the last fifty years advanced mathematical tools have become an integral part in the development of modern economic theory. Economists continue to invoke sophisticated mathematical techniques and ideas in order to understand complex economic and social problems. In the last ten years the theory of Riesz spaces (vector lattices) has been successfully applied to economic theory. By now it is understood relatively well that the lattice structure of Riesz spaces can be employed to capture and interpret several economic notions. 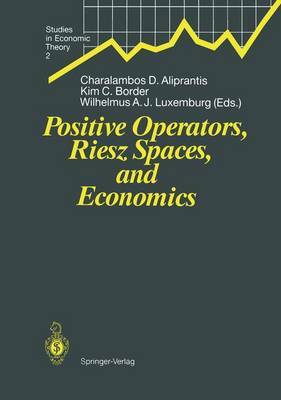 On April 16-20, 1990, a small conference on Riesz Spaces, Positive Opera- tors, and their Applications to Economics took place at the California Institute of Technology. The purpose of the conference was to bring mathematicians special- ized in Riesz Spaces and economists specialized in General Equilibrium together to exchange ideas and advance the interdisciplinary cooperation between math- ematicians and economists. This volume is a collection of papers that represent the talks and discussions of the participants at the week-long conference. We take this opportunity to thank all the participants of the conference, especially those whose articles are contained in this volume. We also greatly ap- preciate the financial support provided by the California Institute of Technology. In particular, we express our sincerest thanks to David Grether, John Ledyard, and David Wales for their support. Finally, we would like to thank Susan Davis, Victoria Mason, and Marge D'Elia who handled the delicate logistics for the smooth running of the confer- ence.